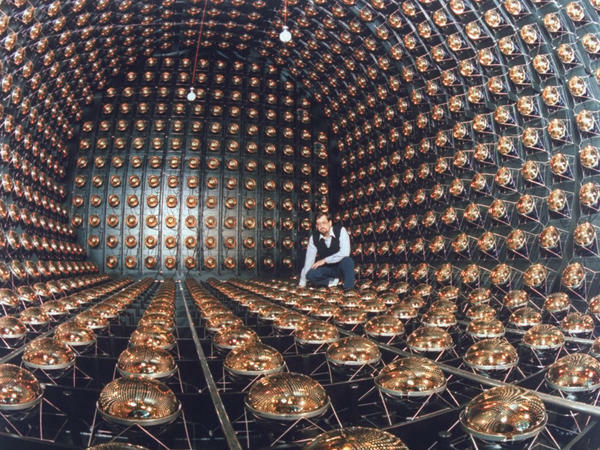 A neutrino detector like this one, seen at Los Alamos National Laboratory in 1995, was used to collect data claiming that neutrinos can travel faster than the speed of light. When highway engineers bored a 6-mile-long tunnel through the Gran Sasso mountain in Italy, physicists persuaded them to dig them an underground laboratory there, while they were at it. That lab houses a target for subatomic particles that get shot through the Earth's crust from a particle accelerator on the Swiss-French border, more than 450 miles away. It's remarkable that these ghostly particles, called neutrinos, have no trouble traveling though solid rock. "They're very light; they're very tiny; they interact very, very weakly; they're constantly passing through us; they're constantly passing through the Earth," says James Gillies, a physicist at CERN, the lab that produces these neutrinos. "But because there are so many of them, their influence is quite large." CERN fires the neutrinos down to the lab in Italy so scientists there can watch as these neutrinos do the strange things that they do, such as changing from one type of neutrino to another. Now, the scientists say they've made an even more remarkable observation: Their latest results suggest that these neutrinos travel faster than the speed of light. Gillies says this violates one of the fundamental building blocks of modern physics. "If real, it's a very surprising result," he says. "That's a very big if." The team of 160 scientists, from 11 countries, made their case today at a seminar at CERN. To measure the neutrino's speed, they need to know exactly when the particles leave the accelerator, when they arrive in Italy, and exactly what distance they traveled. And that's tricky. For instance, collaboration spokesman Dario Autiero said they wanted to shut down traffic in the tunnel near the underground lab to make precise distance measurements. "In the end we negotiated to stop one lane in one of the two independent tunnels." And they were able to nail the distance from the Swiss accelerator to their detector to within a foot. They also spent many months getting clocks to sync up to within a few billionths of a second. In short, Autiero said they simply can't find any errors that would explain their result. "Therefore we present to you today this discrepancy, this anomaly," Autiero said at the seminar. The anomaly he's referring to is that of an object traveling faster than the speed of light. That violates Einstein's theory of relativity, so if it's true, it would upset a great deal of modern physics. Even so, the reaction at the seminar was more than just polite. Physicists in the audience praised the team for its painstaking work, then spent the next hour asking pointed questions about the experiment. They found no glaring, fatal flaw, but Jenny Thomas from the University College London, says that's not to say anyone — including Autiero himself — believes that they really have dealt a serious blow to the theory of relativity. "It's always exciting to be forced to think out of the box," Thomas says. "But in the end I'm not waking up at night worrying, 'Oh my god, oh my god, neutrinos go faster than the speed of light.' "
In fact, Thomas is involved in a similar experiment in the United States involving an accelerator in Illinois and an underground lab in Minnesota. And they're gearing up now to put the European claim to the test. And I'm Melissa Block. A fundamental rule of nature is that nothing travels faster than the speed of light. But physicists working in Europe say they may have discovered a subatomic particle that breaks that speed limit. It's an extraordinary claim. And as NPR's Richard Harris explains, it's being greeted with a healthy dose of skepticism. When highway engineers bored a 6-mile long tunnel through the Gran Sasso Mountain of Italy, physicists convinced them to dig them an underground laboratory there while they were at it. That lab houses a target for subatomic particles. They get shot through the Earth's crust from a particle accelerator on the Swiss-French border, more than 450 miles away. It's remarkable that these ghostly particles called neutrinos have no trouble traveling though solid rock. JAMES GILLIES: They're very light. They're very tiny. They interact very, very weakly. They're constantly passing through us. They're constantly passing through the Earth. But because there are so many of them, their influence is quite large. HARRIS: James Gillies is a physicist at CERN, the laboratory that produces these neutrinos. CERN fires them down to the lab in Italy so scientists there can watch as these neutrinos do the strange things that they do, such as changing from one type of neutrino to another. Now, the scientists say they've made an even more remarkable observation. 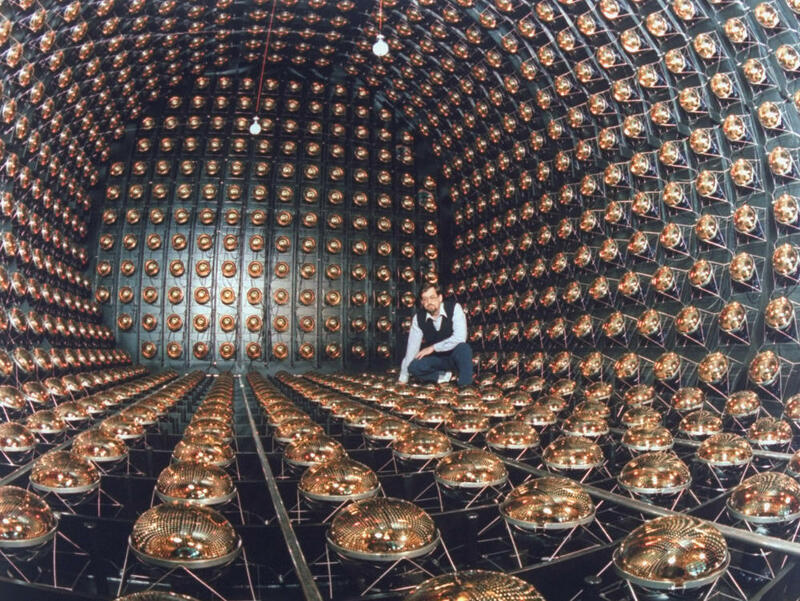 Their latest results suggest that these neutrinos travel faster than the speed of light. Gillies says this violates one of the fundamental building blocks of modern physics. GILLIES: If real, it's a very surprising result, but that's a very big if at this stage. HARRIS: The team of 160 scientists from 11 countries made their case today at a seminar at CERN. Now, to measure the neutrino's speed, they need to know exactly when the particles leave the accelerator, when they arrive in Italy and exactly what distance they traveled. And that's tricky. For instance, collaboration spokesman Dario Autiero said they wanted to shut down traffic in the tunnel near the underground lab in order to make precise distance measurements. DARIO AUTIERO: In the end, we negotiated to stop one lane in one of the two tunnels, you know, the two independent tunnels. HARRIS: And they were able to nail the distance from the Swiss accelerator to their detector to within a foot. They also spent many months getting the clocks to synch up to within a few billionths of a second. In short, Autiero says they simply can't find any errors that would explain their result. AUTIERO: Therefore, we present to you today this discrepancy, this anomaly. HARRIS: The anomaly being an object traveling faster than the speed of light. That violates Einstein's theory of relativity. So if it's true, it would upset a great deal of modern physics. Even so, the reaction at the seminar was more than just polite. HARRIS: Physicists in the audience praised the team for its painstaking work and then spent the next hour asking pointed questions about the experiment. They found no glaring fatal flaw. But Jenny Thomas from the University College of London says that's not to say that anyone, including Autiero himself, believes that they actually have dealt a serious blow to the theory of relativity. JENNY THOMAS: It's always exiting to be forced to think out of the box. But in the end, you know, I'm not waking up at night worrying, oh, my God, oh, my God, neutrinos go faster than the speed of light. HARRIS: In fact, Thomas is involved in a similar experiment in the United States, involving an accelerator in Illinois and an underground lab in Minnesota. And they're gearing up now to put the European claim to the test. Richard Harris, NPR News. Transcript provided by NPR, Copyright NPR.